Beth Ann & Jessica's Helpful Savings: NoMoreRack: Pink Cuisinart Immersion Hand Blender $25 Shipped! 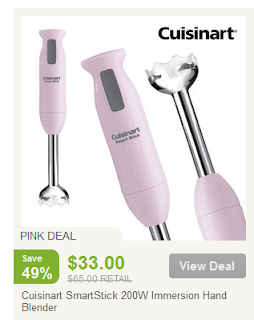 NoMoreRack: Pink Cuisinart Immersion Hand Blender $25 Shipped! Get this Cuisinart SmartStick 200W Immersion Hand Blender in PINK for $25 shipped after $10 sign-up coupon and $2 shipping from NoMoreRack! Use the $10 coupon on any purchase over $30. Shipping is $2 per item.